Vietnamese cuisine is brilliant for combining a contrast of flavors and textures into a single dish, and I think bun thit nuong, or better yet bun thit nuong cha gio, is a great example of this. The dish normally begins with a handful of chopped up herbs and lettuce at the bottom of a bowl, then in goes fresh rice vermicelli noodles (similar to Thai khanom jeen noodles), then a few skewers of grilled pork are layered on that, and finally a sweet and salty fish sauce, and a scoop of oily chives and green onions, and pickles are all added on top. If you get the bun thit nuong cha gio, in addition to everything already mentioned, you’ll also get a fried spring or two chopped up on top, which bumps the delicious-meter up another notch. The noodles are soft and silky, the pork is tender, salty, and sweet, and the egg rolls (cha gio) add a beautiful crunch to everything. When I was in Vietnam, I enjoyed dousing my bowl of bun thit nuong with a few scoops of freshly ground chili (which should usually be on your table) to balance out the sweetness and make it fiery. Bun thit nuong is a dish you should for sure not miss when you’re eating in Saigon. Chị Thông is a well known spot in Saigon for bun thit nuong. I was originally tipped for this spot from Eating Saigon, a great food blog if you’re looking for delicious restaurants to eat at in Saigon. They open starting in the morning and don’t close until the night, so you can go to get your fix of this famous dish pretty much anytime you’re craving it. I decided to go for a mid-morning breakfast – I think we arrived at about 9 am. There were just a few other diners, so it wasn’t too busy, but they still had plenty of fresh food. I ate bun thit nuong cha gio, including rice vermicelli noodles, some shredded herbs and lettuce, and then on top, a couple of grilled skewers of pork, plus a chopped fried spring roll (cha gio). Finally, a scoop of sauce, a spoon of Vietnamese pickles, and a garnish of green onions and pork rinds, to top it off. The bun thit nuong at Chị Thông was very tasty, good quality, and it’s a nice clean restaurant. In addition to delicious food, everyone there was so friendly – when I was taking photos and a video, they were incredibly nice to me. Bánh tằm bì is a food that’s only available in the south of Vietnam, and if you love the flavor of coconut milk, you’re going to fully enjoy banh tam bi. 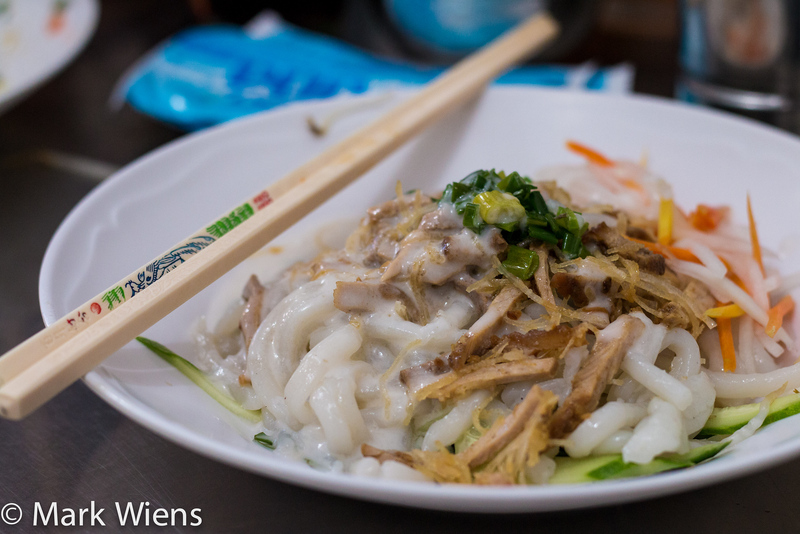 Just like banh canh cua (food featured above), banh tam bi is a dish that uses a similar thick noodle – yet the flavor and the toppings are much different. A plate of banh tam bi often begins with a handful of roughly cut herbs, including lots of sweet basil and Vietnamese coriander on the bottom, topped by a pile of thick sticky rice noodles, a scoop of both finely shaved pig skin and pork meat, a garnish of green onions, and finally a ladle of thick coconut cream sauce. The noodles are sticky and soft, the herbs add a nice fresh touch, and the gravy is typically sweet and buttery from the coconut milk. While I did think banh tam bi was pretty good, it’s not a dish I really loved because it was on the sweet side for me, and lacking a strong or spicy flavor. Nevertheless, it was very enjoyable and I did like it, but it would be more of an occasional dish on my Vietnamese menu repertoire. But again, if you love coconut milk, you should by all means try banh tam bi. Bánh Tằm Bì Đồng Tháp was a restaurant I was recommended to try, and after exploring Chinatown in the morning, we weren’t too far from the restaurant, so we checked it out. From the outside, I could see the noodles in the display cabinet, and again, they looked almost like Japanese udon noodles. The little shop was homely and small. At the front were a few display cabinet street food carts, serving both banh tam bi and some Vietnamese desserts (which I didn’t try but looked quite popular). Behind the street food carts was a full dining room with little stainless steel tables and chairs. I ordered just the normal plate of banh tam bi, with was assembled by one of the kind ladies there. It was rich and creamy, and although as I mentioned already, it was a little sweet for me, I did really like the mix of fresh Vietnamese herbs, and the rich coconut milk. They also serve a number of other dishes like cha gio (fried spring rolls) and banh mi (sandwich). I’m a huge fan of Vietnamese bánh cuốn, and though originally comes from the northern part of the country, it’s extremely popular throughout Saigon. 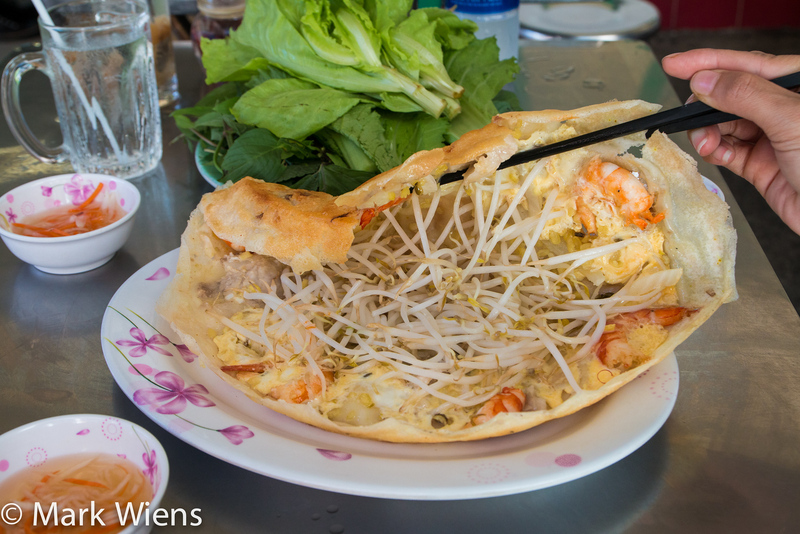 To prepare the recipe for banh cuon, a thin layer of rice and tapioca flour batter is steamed into a noodle like crepe. 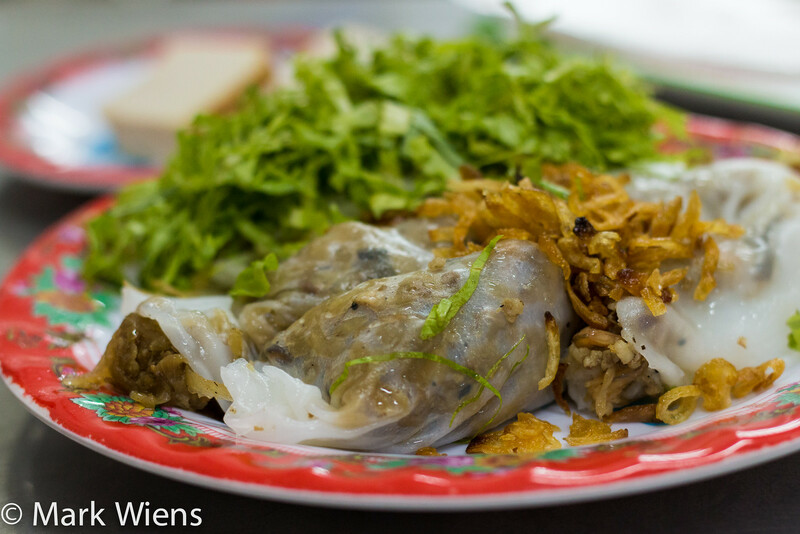 It’s then filled, often with a combination of lightly seasoned minced pork, small dried shrimp, and wood-ear mushrooms, and served with finely shaved lettuce and blanched bean sprouts on the side. Finally, you can’t eat banh cuon without dipping it into sweet fish sauce, known as nuoc cham, the stuff many people say is the lifestream of Vietnamese cuisine, and I personally can’t live without chilies. What I love about banh cuon are the soft fresh noodle wrappers, and since I’m not a huge desserts or sweets lover, I like the salty mix of pork and shrimp on the inside. When I was walking though local fresh wet markets in Saigon, I noticed banh cuon being made all over the place, especially in small tightly packed alleys. 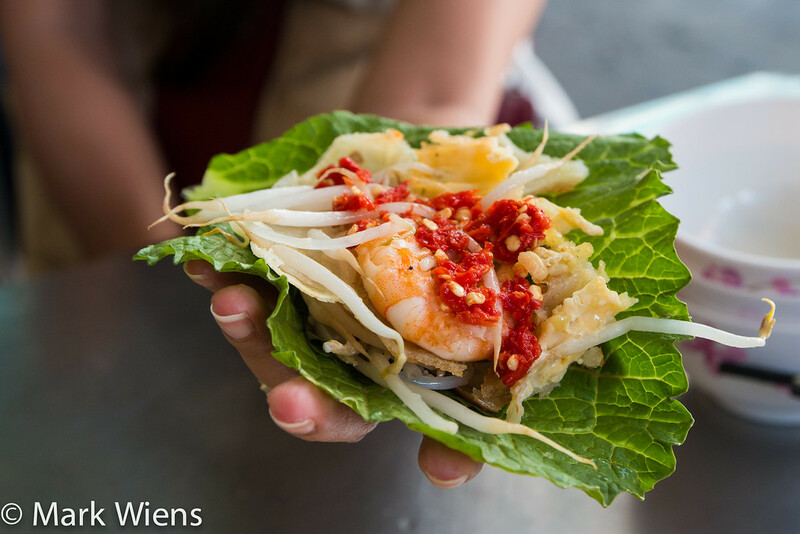 So keep an eye out for banh cuon all over the place. 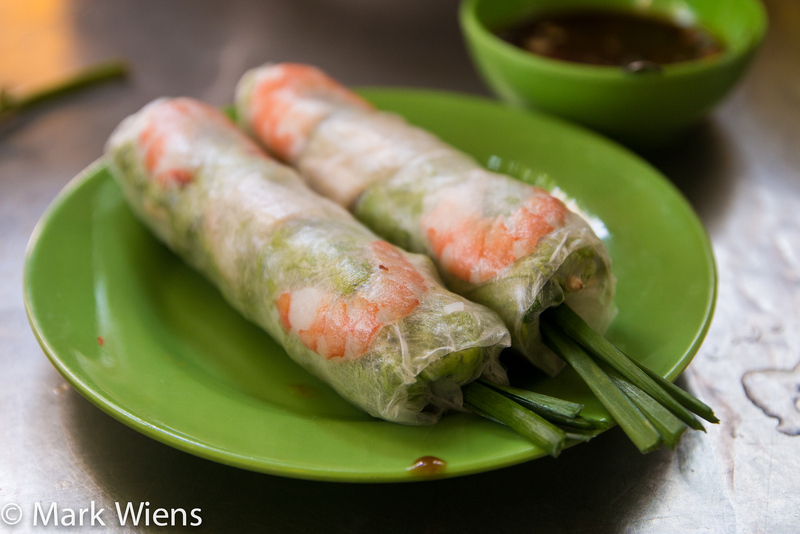 One of the most well known restaurants to eat banh cuon in Saigon is Banh Cuon Hai Nam. The restaurant is not hard to miss, with its huge big blue sign and red popping characters, and at night, the sign lights up with near obnoxious flashing lights, and a host of pink shirted waitresses and cooks. On the front patio of Banh Cuon Hai Nam you can watch the the rice batter crepes being steamed, and then freshly assembled into the delicious rolls. They actually have a full menu of different Vietnamese noodle dishes you can order, but the main and most popular dish is their banh cuon. I also tried their version of banh beo, little bowl sized cakes topped with the same filling as the banh cuon, which were also very tasty as well. On my first visit to Banh Cuon Hai Nam, I came along with KyleLe.net, who said it was one of his favorite spots in Saigon for banh cuon. Sort of like a crepe, and sort of like a Thai oyster omelet, a Vietnamese banh xeo is a crispy savory snack that’s a favorite for many. Just like banh mi sandwiches, banh xeo is a bit of a French inspired Vietnamese culture creation. By far the best part of eating banh xeo for myself is getting to dress and garnish each bite with a bounty of herbs and toppings (are you seeing the pattern with herbs and vegetables in Vietnamese cuisine!?). You can really eat banh xeo however you want, but the common method is to take a few leaves of lettuce or mustard leaves, load in a piece of the golden crispy crepe, top it with some more herbs like sweet basil and perilla leaves, add some chili (or a lot of it), roll it up like a green spring roll, and then dip the entire treat into the sweet Vietnamese fish sauce dressing. From what I understand, banh xeo in the south of Vietnam are usually larger in size, almost approaching south Indian dosa status, while in other parts of Vietnam they are usually smaller. Undoubtedly the most well known restaurant in all of Saigon for devouring hot and huge banh xeo is Banh Xeo 46A, and just like the famous Lunch Lady, Anthony Bourdain ate here and made it extremely famous. Their menu is written in Vietnamese, English, and Japanese, and they might even have a few other languages as well – so you can tell how well known they are – they’ve been included in just about every Vietnam travel guide and food guide. 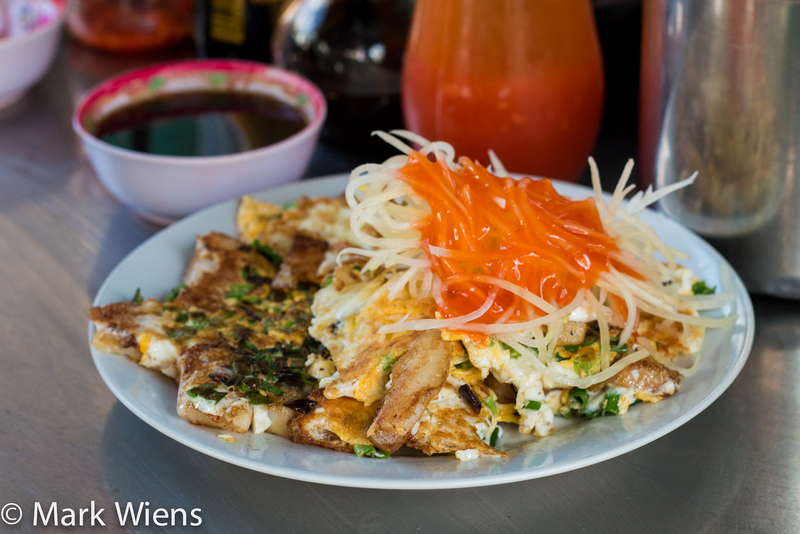 Today Banh Xeo 46A remains one of the most popular spots in Saigon for the dish. It’s a nice open air restaurant, tucked down a side street. The cooking is all done in the front of the restaurant, and you can see your crepe being prepared right in front of you – and they still use charcoal. Ying and I ate here with Kyle, and we ordered the special sized banh xeo, a huge crepe filled with shrimp and pork belly. The herbs and vegetables were my favorite part of eating banh xeo. 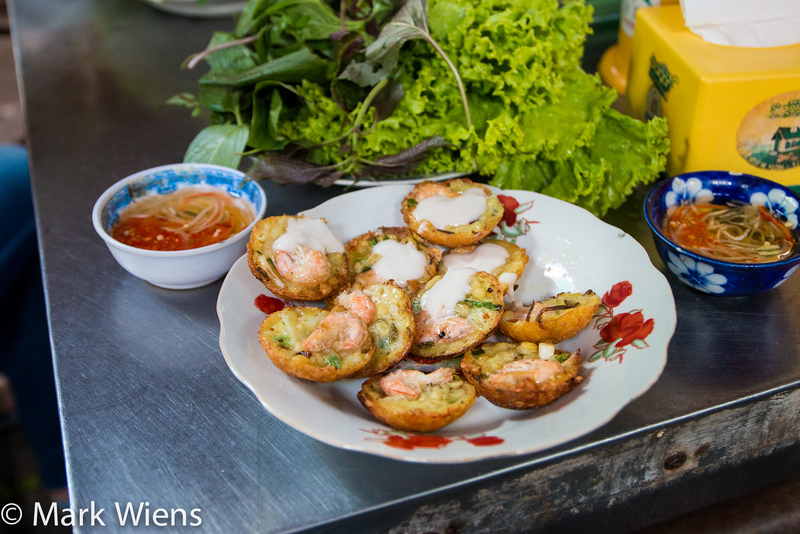 While banh xeo is the crepe of Vietnamese cuisine, banh khot are the little pancake sliders. 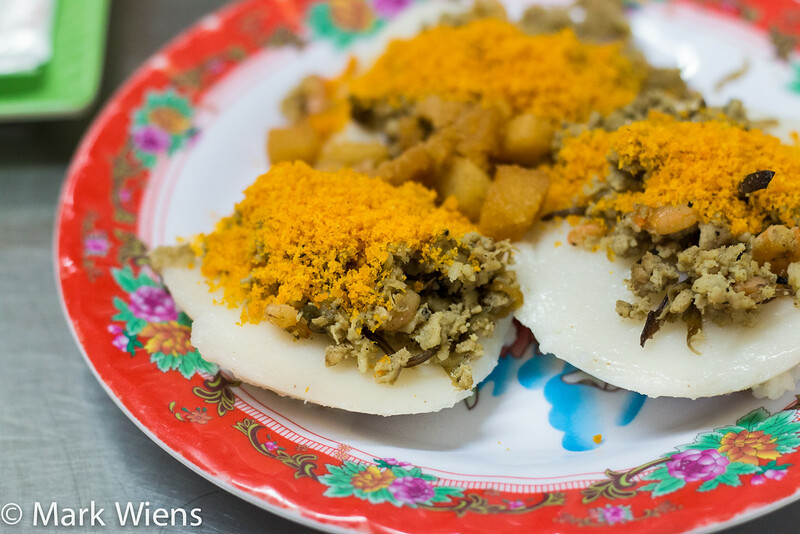 I have to say that for myself personally, I enjoy eating banh khot probably better overall than banh xeo – banh khot makes a delicious little light meal or snack. The batter of banh khot is made from rice flour, sometimes even leftover rice like in Helen’s recipe, coconut milk, and a hint of turmeric powder to give it that slightly yellow color. 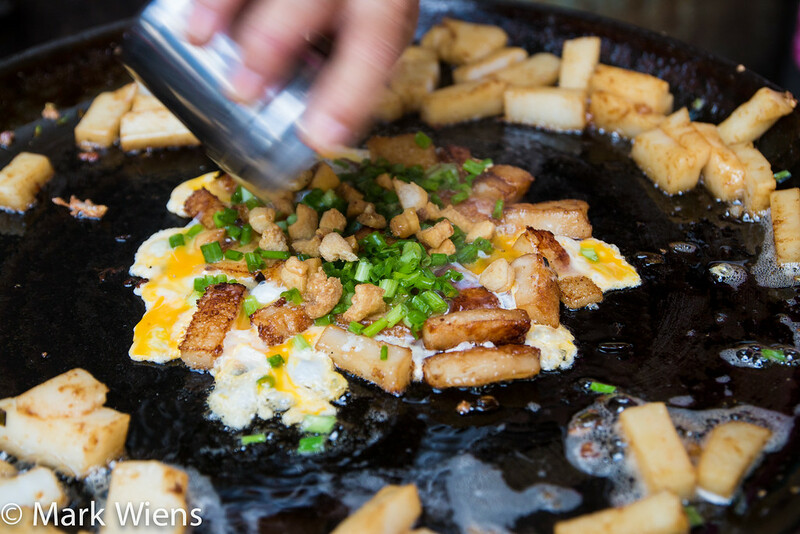 The batter is then fried in a hot griddle, the same pan used to make Thai khanom krok (little coconut griddle cakes). As the batter is sizzling away in plenty of oil, a shrimp is placed in the center of the griddle pancake along with a sprinkle of green onions, which cooks into the top of the batter. The banh khot is finished when the batter is cooked, and the outside is golden and crispy. Banh khot, just like banh xeo, is served with a healthy assortment of lettuce and mustard leaves, and herbs and green leafy vegetables. Finally, banh khot wouldn’t be complete without the sweet fish sauce dressing. Banh khot is an excellent Vietnamese street food, and as I was walking around local markets in Saigon, I noticed banh khot being made in a number of different places, always quite popular, and at nearly every stall there were people waiting to order. While exploring Chợ Bàn Cờ market one morning, I stopped at a banh khot stall (which I’m not sure of the name, but I did include it on the map). She quickly made her banh khot, pouring in the batter, and the smell and sizzle could be detected from across the market. One of the things I loved about the banh khot here is that after I ordered a plate, she asked if I wanted some extra coconut cream on top. I got half of them with coconut cream, but after tasting it, I wish I would have gotten all of them topped with it. Anyway, they were freshly fried, still hot and extremely crispy, and one of the best things was the amazing market environment (watch the video if you haven’t already). When I ate at Co Ba Vung Tau, a nicer end restaurant, I had no clue it was famous for banh khot. But by a random chance I happen to order banh khot, among a few other dishes. Overall the food was good, the service was friendly, and it is a very popular restaurant with local Vietnamese. I thought the banh khot at the street food stall topped with coconut cream was overall more my style, but Bánh Khọt Cô Ba Vũng Tàu is a nice clean restaurant to eat banh khot. Their menu also includes all sorts of other dishes, and Vietnamese desserts. In Singapore and Malaysia it’s known as a carrot cake, in Thailand it’s kkanom pak gat, and in Vietnam it’s known as bot chien. But all versions have Chinese Teochew chai tao kway to thank. It’s not the healthiest Vietnamese delicacy, that’s for sure, but it sure is tasty once in a while. Again, just like some other dishes on this guide, for bot chien I headed to Chợ Bàn Cờ market, mostly because it was near where I was staying, and it’s a wonderful local market (but there are many other similar markets scattered in abundance throughout the city). Within a lane, there was a table set up, surrounded by motorbikes, like so many other street food dining establishments in Saigon, and as I approached I could smell the sizzling rice cakes. The bot chien was served on a plate, along with a side sauce which I think was a mostly soy sauce and vinegar that had a sweet tinge to it. What I really liked about this version of bot chien was that she served it topped with a handful of thinly shredded green papaya, giving it a nice fresh touch. Open hours: I’m actually not sure, but I ate this plate of bot chien at about 10 am and she was open. I think she’s open from morning to evening. For a more sit down bot chien experience, check out Bột Chiên Đạt Thành.